Happy Daylight Savings to you. I woke thirsty this morning. Not for natural water, but for Living. My dry soul panting for the Lord. Longing and faint in a weary world that is starving and parched for life, joy and any morsel of hope. My thirst led me to Psalm 63. Oh sweet reader. Drink from the fountain this morning. Open wide the well of your soul and seek Him…earnestly. In reality, we didn’t lose an hour of sleep, but instead have the opportunity to get into His presence and hour sooner. Be blessed as your thirsty soul reads along. Go ahead and read it out loud, too. Let your heart hear. O God, you are my God, earnestly (EARLY) will I seek You; my inner self thirsts for You, my flesh LONGS and is faint for You in a dry and weary land where there is no water. I have looked upon You in the sanctuary to see Your power and Your glory. Because Your loving-kindness is better than life my lips shall praise You. So will I bless You while I live; I will lift up my hands in Your name. My whole being shall be satisfied as with the richest of foods; and my mouth shall praise You with joyful lips when I remember You upon my bed and meditate on you in the night watches. For You have been my help and in the shadow of Your wings will I rejoice. My WHOLE BEING follows hard after You and clings closely to You; Your right hand upholds me. 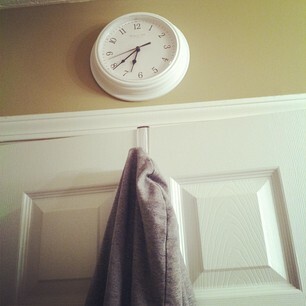 And just curious: Does anyone else have that one clock that you never changed? WE have a clock in the kitchen that is never changed and it plays Christmas music at the top of every hour! Yep. Downstairs in the den. Hope I can remember that it is now correct. Happy Day – one of my favorites of the year! Oh yes Becky, and this made me laugh! It is in my bathroom, just like yours! And not only has it been one hour ahead, but it is also fifteen minutes ahead of that just to keep us from getting off schedule….has required some calculating each day! I looked up this morning and was so relieved to find it almost on time for a change!